Once you’ve completed that task you’ll automatically be awarded the Radioactive Ooze Pit…. What are your thoughts on the Radioactive Ooze pit? Where have you placed it in your Springfield? Sound off in the comments below, you know we love hearing from you! 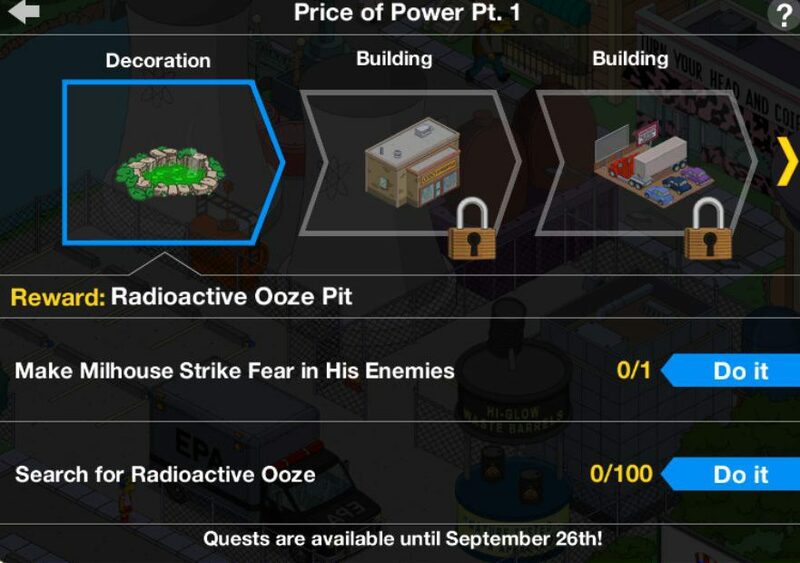 This entry was posted in Super Powers, Tips and Tricks, Updates and tagged radioactive ooze pit size, Tapped Out Super Powers, Tapped Out Superheroes 4, Tapped Out Tips and Tricks, The Simpsons Tapped Out, TSTO Addicts, TSTO Super Powers Mini Event, TSTO Tips and Tricks, What does the radioactive ooze pit do. Bookmark the permalink. More ooze.. make it a permanent decoration. With all the tasks about nuclear waste, it goes well with Springfield. Let’s have more. Looks just like my hot tub in the backyard. Sorry to be off topic, but did anyone else get mugged by EA today. On My second login I noticed I was 5 millions short. If u have cecil u may have accidently sent him on a task that cost 5 million. I did that once…except it was 10 million. Fool me once…. Yup! That’s why Cecil is my only full character that lives in storage. He spends too much dam money! 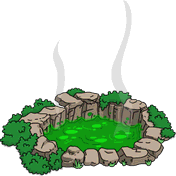 Mine too…I have the outlands/damaged skin on the towers, so they are already filled with green ooze, and the pit goes perfect next to them. I put it in front of the Fortress of Lonelietude. It seemed to fit there. I’d love to get more of them. I put mine beside the Happy Sumo – in Marine World with the Slimu Auditorium. I’m kinda neutral on this. Pretty item, but that’s it.